MADRID, July 13, 2010 (AFP) - Spain's victorious World Cup squad returned to a heroes' welcome in Madrid with hundreds of thousands of fans cheering the team as they paraded through the capital's streets on an open top bus. People chanted "Campeones! Campeones! Campeones!" and waved red and gold Spanish flags at the players as the black bus crawled along a roughly eight-kilometre (five-mile) route through the city's main thoroughfares Monday amid scorching temperatures. Fans waved at the players from balconies while others climbed on trees to get a better view of the 23-man squad which won the World Cup for the first time in Spain's history with a 1-0 extra-time defeat of the Netherlands on Sunday. "We can speak of there being several hundred thousand people," a spokeswoman for the mayor's office told AFP, while public television TVE estimated that over one million people had turned out for the celebration. Real Madrid keeper Iker Casillas waved a Spanish flag with a black bull on it as the bus passed the central Cibeles fountain, while Barcelona midfielder Xavi simulated throwing the trophy at the jubilant crowd. Air force fighter jets flew overhead leaving the Spanish colours streaked in the sky. The parade ended at the esplanade near the riverside Puente del Rey, where the festivities continued officially until midnight. "I want to congratulate from the bottom of my heart these 23 players for this victory but behind them they had the united force of all Spaniards," Prime Minister Jose Luis Rodriguez Zapatero said at a reception for the players at his official residence ahead of the victory parade. "They won this trophy but it belongs to all Spaniards and it is a win also for all players from previous generations who tried to win it. They won because they were the best, because they played as a team and they played cleanly." 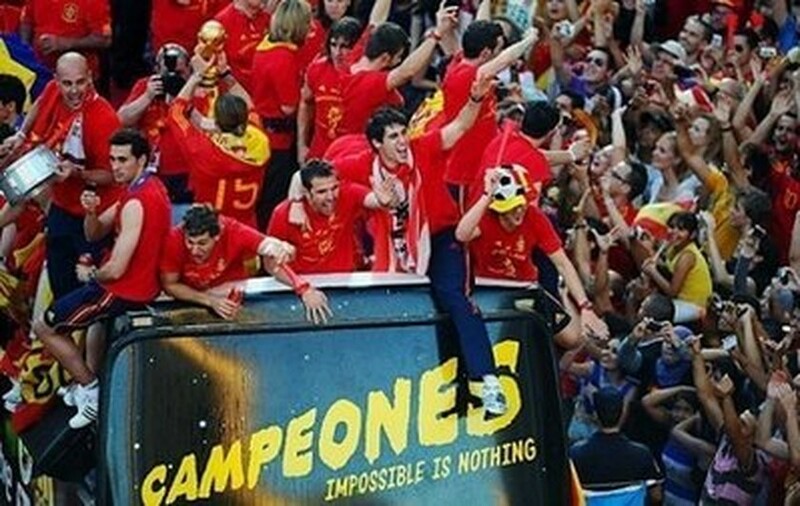 Spain won the 2008 European Championships but had never even reached a World Cup final before. Until this year the best Spain had managed was the quarter-finals. Barcelona midfielder Andres Iniesta, who scored the winning goal against the Netherlands just four minutes before the final whistle, presented the prime minister with a red team jersey signed by all the players. "Thank you for the welcome, I am very proud to be a part of this team and this little trophy is for everyone," Iniesta said at the reception after earlier thanking a German octopus for predicting the Spanish victory. Before meeting with Zapatero, Spain's King Juan Carlos also hosted a reception for the squad at his palace in Madrid where he thanked the team for making "our dreams a reality". "Thank you champions, on behalf of all of Spain and all Spaniards," said Juan Carlos who did not travel to South Africa as he is recovering from lung surgery. "This is a well-deserved triumph for an exceptional team." The squad arrived at Madrid's Barajas airport just before 2:00 pm (1200 GMT) on an Iberia plane that features Spanish flags flying from the cockpit windows. A huge cheer erupted from a crowd gathered at the airport when keeper Iker Casillas emerged from the plane with coach Vicente del Bosque and held aloft the golden trophy. The World Cup victory has brought a sliver of happiness to a country where around 20 percent of the active population is jobless, the highest rate in the 16-nation eurozone. For many along the parade route this was their second straight night celebrating Spain's World Cup win. Tens of thousands of people danced, cheered and set off fireworks in the Spanish capital overnight Sunday after the final whistle. Others imitated bullfighters and waved large Spanish flags over passing cars while chanting "Ole!" "Champions," wrote right-wing newspaper ABC on its front page below a photo of Casillas holding up the World Cup trophy, surrounded by his teammates. Sports daily AS said on its front page that Iniesta "scored the most important goal in our history" while sports daily Marca said his goal "lifted Spanish football to the highest possible level."